Quercus robur L. (English or Pedunculate Oak) is one of two closely related species of oak native to the British Isles. It ranges across Europe from northeast Russia to southwest Asia, to Spain and northern Africa. The other species, Q. petraea (Matt.) Liebl., is native to Europe and western Asia. The wood of the two species is indistinguishable, and has long been used for boat building, docks and harbours, railway waggons, ladders, furniture, cabinet making, and cooperage for alcoholic drinks. Specific gravity -- a good indicator of the density and strength of wood -- ranges from 0.67 to 0.72. The wood seasons slowly and has a tendency to split. The acidic nature of the wood will corrode metal nails, so non-ferrous or galvanised nails must be used. The closely related white oaks from North America (including Q. alba L.) tend to be lighter in colour, but are of similar density and are used for similar purposes. The three-dimensional reconstruction shown at left (click image for larger version) is in the transverse plane (i.e., a cross-section). It shows the outer nine annual rings of wood (secondary xylem), with the bark (periderm - corky layers on the left, phloem on the right adjacent to the wood) on the outside (i.e., left). Little detail can be seen in the bark, but the growth rings are clearly visible in the wood and range from 6 to 11 mm in width. This variation is related to differences in climate from one growing season to the next, and ring patterns are used as the basis of dendrochronology. At the beginning of each growth ring are very wide vessels up to about 400 microns in diameter, which appear as black holes. These earlywood vessels are clearly visible and are much more efficient conductors of water up the tree than the narrower latewood vessels. In ring porous hardwoods like oak and elm, most of the water is conducted up the outer growth ring, and the earlywood vessels in growth rings formed in previous years are non-functional. The latewood in each growth ring consists of white areas comprising narrow vessels and axial parenchyma, and grey areas of fibres. The horizontal white lines running radially through the inner bark and the entire wood are wide rays. If an entire trunk disc were shown, these would appear like spokes in a wheel. At the junction between the bark and the wood is a meristematic tissue called the cambium, which is too narrow a layer to be detected at this magnification. Cell divisions take place in the cambium to produce secondary xylem (wood) towards the inside of the stem (i.e., right), and secondary phloem (the tissue that transports sugars from the leaves to all other parts of the plant) towards the outside (i.e., left). This specimen of pedunculate oak (shown below), a small part of a much larger specimen, comes from Malvern in England. 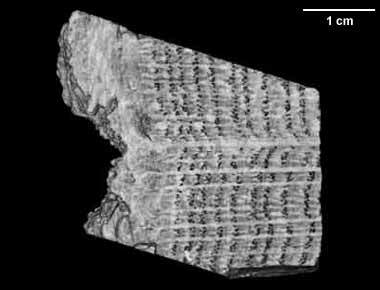 It was made available for scanning by Dr. Wolfgang Stuppy of the Royal Botanic Gardens, Kew, UK. Funding for scanning was provided by a National Science Foundation Digital Libraries Initiative grant to Dr. Timothy Rowe of the Department of Geological Sciences, The University of Texas at Austin. This specimen was scanned by Matthew Colbert on 15 March 2002 along the short axis for a total of 152 1024x1024 pixel slices. 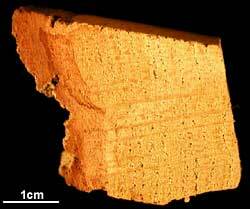 Each slice is 0.163 mm thick, with an interslice spacing of 0.163 mm and a field of reconstruction of 51 mm. Baillie, M.G.L. 1982. 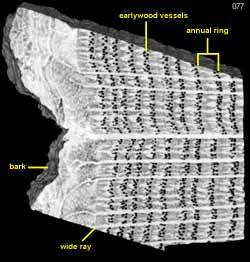 Tree-ring dating and archaeology. Croom Helm, London & Canberra. Bean, W.J. Trees and shrubs hardy in the British Isles. Many editions, John Murray. Ellmore, G.S., and F.W. Ewers. 1985. Hydraulic conductivity in trunk xylem of elm, Ulmus americana. International Association of Wood Anatomists Bulletin 6: 303-7. Gasson, P. 1987. Some implications of anatomical variations in the wood of pedunculate oak (Quercus robur L.), including comparison with common beech (Fagus sylvatica L.). International Association of Wood Anatomists Bulletin 8:149-166. Lincoln, W.A. 1986. World woods in colour. Stobart & Son Ltd, London. Mitchell, A. 1974. A field guide to the trees of Britain and Northern Europe. Collins. Stuppy, W. H., Maisano, J. A., Colbert, M. W., Rudall, P. J., and T. B. Rowe. 2003. Three-dimensional analysis of plant structure using high-resolution X-ray computed tomography. Trends in Plant Science 8:2-6. Movie showing three-dimensional endocast of the vessels through the wood. Click on thumbnail to view movie. 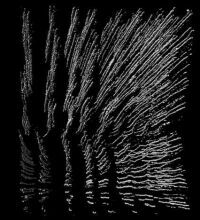 To cite this page: Dr. Peter Gasson, 2002, "Quercus robur" (On-line), Digital Morphology. Accessed April 25, 2019 at http://digimorph.org/specimens/Quercus_robur/.